Soon after Leo Fender put the first mass-produced solidbody electric guitar, the Esquire, into production in the Spring of 1950, he turned his attention to its low-end equivalent, the Precision Bass. Appearing the following year in 1951 and often referred to as the P-Bass for short, it was the first bass instrument of its type and offered players a unique way of navigating a horizontal neck using frets - as opposed to an upright/fretless model - with comfort, ease and accuracy of pitch (hence the ‘Precision’ moniker). Musical styles were rapidly changing, and the creative abandon encouraged by jazz music had installed a sense of freedom with regards to technique. The P-Bass turned out to be a smashing success and became the virtual blueprint for what is still considered to be a staple instrument within the field of contemporary music. 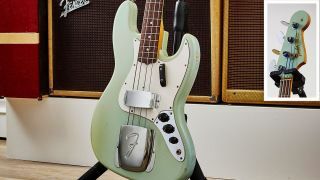 The burgeoning electric jazz, blues and rock ’n’ roll movements were all about making fresh sounds, and during this intensely imaginative period of the 1950s, Fender went far beyond establishing themselves as a regular musical instrument supplier by essentially creating demand within a brand-new market based on multiple, often radical, design innovations. 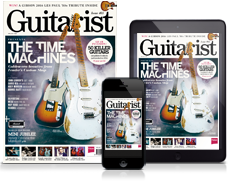 Throughout the decade, their catalogue was further refined and expanded to include several different models of electric solidbody guitars and amplifiers. By 1959 the company had decided it was high time they revisited and progressed their concept of the solidbody electric bass guitar. Released in 1960 with a standard threetone Sunburst finish, offset body shape and slab rosewood fingerboard, the Jazz Bass was introduced as a follow-up to the widely popular Precision Bass model. It included a new set of features designed to enhance playability, expand the tonal range and further attract bassists away from traditional upright instruments. With a distinctively narrow nut measuring 1.5 inches and utilising a 34-inch scale length with more compact string spacing than the P-Bass, the new Jazz Bass inspired a certain ease of play that encouraged bass guitarists to perform with greater speed and dexterity, if required, and topped the P-Bass list price by $50 at $279.50. The Jazz Bass came equipped with two single coil pickups, each sporting two polepieces per string for a rounder tone, wired to provide noise-cancelling. Originally, tone and volume for each pickup was controlled via individually assigned concentric pots, or ‘stacked’ knobs. In 1962, however, this control layout was altered to include two single volume knobs for each pickup, along with a slightly smaller master tone knob used to treble bleed both pickups simultaneously. The original Jazz Bass design also included a mute system positioned at the bridge, although this was soon dropped in 1963 with palm-muting techniques having become the preferred approach for a majority of players. Throughout the 1960s the popularity of the Jazz Bass snowballed - albeit not necessarily in the field of jazz music, despite its moniker, as was the case with the Jazzmaster. It became the instrument of choice for some of the era’s most revered and influential artists, including slap-pop originator and funk icon Larry Graham, Jimi Hendrix’s Noel Redding and The Who’s John Entwistle. Having changed little in terms of basic design, the Fender Jazz Bass has remained in production ever since its arrival nearly 60 years ago.